At Dermatolgic Surgery Center we are currently scheduling new patients for all providers with very little wait time. Book Today! Have you considered a surgical procedure like a facelift or a necklift to improve your look and restore youthfulness? Before undergoing any extensive procedure, it is always important to know all of your options. A facelift is an incredibly invasive surgery that can require weeks to months of recovery time. Dermatologic Surgery Center offers an alternative to the surgery: a liquid facelift. The liquid facelift procedure is minimally invasive and requires little to no downtime. Using a unique mix of cosmetic injections and specialized injection methods, we can deliver patients the age-defying results they want without having to go under the knife. Call or visit Dermatologic Surgery Center today to book your consultation for a liquid facelift in Medina, OH. We will lay out all of your options and will develop a specialized treatment plan for you based on your needs. For a long time, facelifts were the most popular option for facial rejuvenation. The procedure produces dramatic results but involves extremely invasive surgery to lift and re-position facial or neck skin. Following surgery, patients generally experience extreme bruising, swelling, and pain associated with healing. Facelift patients will need to take 3-4 weeks off of work and daily activities to properly heal and look normal again. Furthermore, it can take up to a year to regain normal sensation and feeling in the face. Because of advancements in cosmetic procedures, many Medina patients are turning away from the traditional facelift in favor of less invasive alternatives. The liquid facelift offers patients the chance to add volume and shape the face without anesthesia, stitches, extensive side effects, and long recovery. At Dermatologic Surgery Center in Medina, we always try to treat patients with minimally invasive alternatives before referring them to surgery. Who is a good candidate for a liquid facelift? 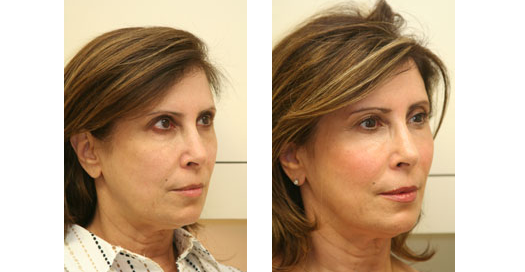 A liquid facelift is a better option for several of our Medina patients. While there are many benefits to a liquid facelift in Medina, the procedure is still not for everyone. At your consultation, our doctor will be able to give you all of your options and address any concerns or questions. What can a liquid facelift treat? A liquid facelift can treat a wide variety of problems associated with aging. While some of our patients are only looking for subtle results, we can also produce a dramatic change depending on the products and methods used. Moreover, because there are no incisions the results are likely to look more natural than a traditional facelift. The liquid facelift procedure at Dermatologic Surgery Center is customized for every patient and their needs. Depending on your situation, the liquid facelift may be able to treat other issues as well. We use a combination of cosmetic injections that is unique to every patient and their desired results. At our Medina office, we only use top-grade injections that we have seen produce the most quality results in our patients. Dermal Fillers: At DSC we offer the dermal fillers Restylane and Juvederm. Both have a base of hyaluronic acid, a substance that naturally occurs in the body but deteriorates over time. Dermal fillers work to replace and enhance areas that have been effected by volume loss because of age. Both Restylane and Juvederm are highly effective at treating hollow areas, moderate to severe wrinkles, and areas that need facial contouring. Kybella: Kybella is the only FDA-approved injection to treat and dissolve a double-chin. A double-chin can develop from aging and is often the reason patient’s look to get a necklift. Kybella offers an effective, non-invasive alternative for those looking to get rid of a stubborn double-chin who do not have an excess of loose skin. When these products are carefully combined they can produce dramatic, natural-looking results that can restore a patient’s confidence. Don’t rush into a surgical procedure without considering all of your options. At Dermatologic Surgery Center we can evaluate you and develop a personalized treatment plan so that you get the results you want without needing an extensive procedure like a facelift. Our expert staff has years of experience treating signs of aging in patients with cosmetic injections. Furthermore, we also offer a wide variety of minimally invasive, effective anti-aging procedures than can enhance the liquid facelift. To find out more about our services and your options, book your consultation to meet with us at our Medina, OH office today! We are excited to help you become the best version of yourself! We service Medina and all surrounding areas, including Akron and Cleveland.